Mount Hope, ON L0R 1W0. 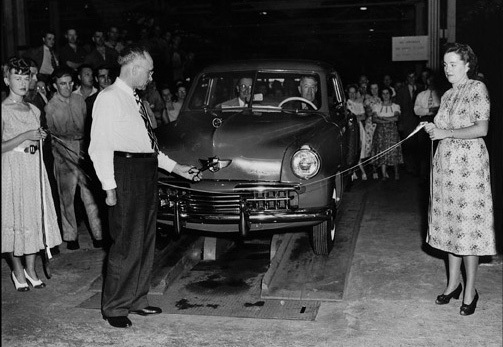 Arthur Eggert, then a 39 year employee, cuts the ribbon as the first car, a champion 4 door sedan, comes off the line on August 18, 1948. These models were built from 1947 to 1949 and included two door coupes, 4 door sedans and convertibles. Photo courtesy of the Studebaker National Museum South Bend Indiana. This is the last Studebaker produced at the Hamilton Plant. It was painted Timberline Turquoise and came off the line on March 17, 1966. Currently, this car has been restored and is on display at the Studebaker National Museum in South Bend Indiana. Our chapter sponsors this vehicle each year. Welcome to the Hamilton Chapter website. The Hamilton Chapter, located in Hamilton, Ontario, home of Studebaker Canada, received its charter from the Studebaker Drivers Club Inc. in 1988. There are currently over 60 family members in our chapter. We meet once a month on the third Sunday, 10 a.m. at the Canadian Warplane Heritage Museum located at the Hamilton airport. During the summer months we meet at various members' homes on the third Monday of the month which makes for a nice informal get together. Our club publishes a bi-monthly newsletter The Bullet-Tin, which reflects our members, their Studebakers, our activities, SDC information and events. It provides a great link for those members who live away from the Hamilton area and who seldom are able to attend club functions or meetings. Our chapter is very social and we endeavour to have fun activities throughout the year. We have cruises to other automotive related meets, go on various tours, or sometimes just cruise to a park for a picnic. We organize five or six chapter events each year, some of which tie in with other chapters in Canada and the U. S. In September, there is an annual members' BBQ with lots of Studebakers as well as other guests in attendance, also hosted at a member's home. The Hamilton currently hosts a website which debuted in 2005 and contains much information about our chapter and its role in both Hamilton and the Studebaker community. We have also maintained a Facebook page since 2015. This page gets many hits and lets our chapter be known in the community. Currently, our club has quite a few Studebakers which are being restored by our members, most of whom already have one that they are driving and enjoying. A look at our members' cars listed in the sidebar will illustrate just how many beautiful vehicles our club members currently own. In addition, a number of our members who have restoration and mechanical skills assist, and give advice to other members when requested. Once or twice a year we have tech sessions to help our members understand various components of the automobile and how they work. 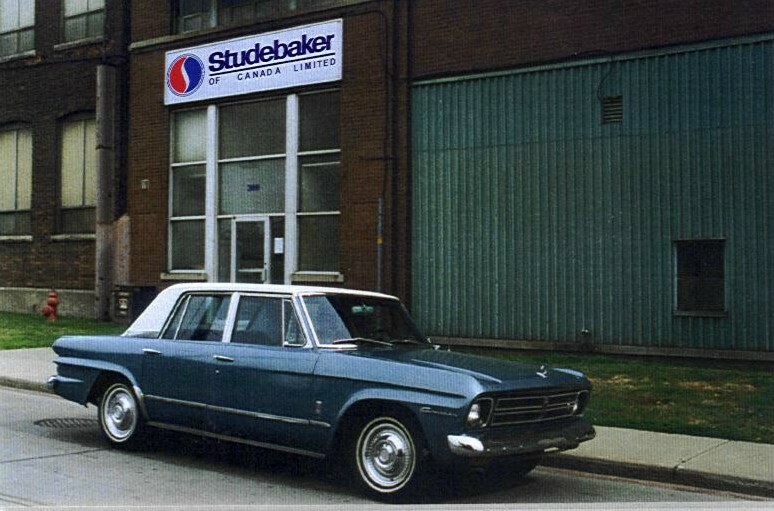 Something else that is very beneficial to us is that we still have club members who worked at Studebaker Canada. This brings a great wealth of knowledge and a historical perspective of the Studebaker automobile to our club. The Hamilton Chapter's mission is to promote good fellowship within our chapter, to preserve and maintain the Studebaker name, its history and the vehicles that they produced. We also endeavour to promote our club and the Studebaker Drivers Club whenever we have the opportunity to do so. In 2016, our club with the support of Ontario Chapter SDC, the Canadian Avanti Owner's Assocation, the Studebaker National Museum, and the Studebaker Drivers Club dedicated a plaque to commemorate the Studebaker production facility in Hamilton. The plaque is installed at the corner of Wentworth St. and Mars Ave. in a parkette adjacent to the former Studebaker plant. It is 24 inches by 36 inches and faces what is now going to be the Freeman Industrial Park. The Hamilton Chapter has applied to have a street within this facility named after Studebaker. When the industrial park is completed, one of the streets will be named "Studebaker Place". This street is located at Victoria Ave and Studebaker Place and is the main street in this industrial complex. In the History of Studebaker In Canada, you will be able to see a copy of the plaque. Owning a Studebaker is not a prerequisite of becoming a member of the Hamilton Chapter, however, membership in the Studebaker Drivers Club Inc. is. If you have any questions or wish more information, please get in touch with us. In closing, we hope that you will enjoy your "cruise" through our site and that you will find it informative and interesting.